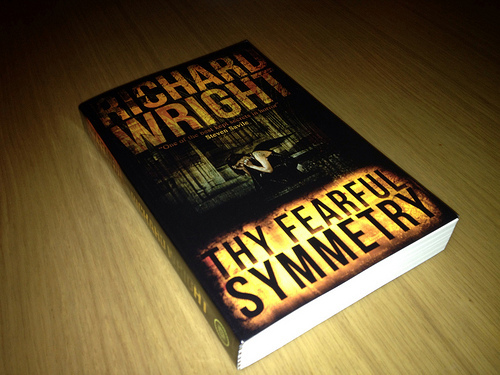 In just one month’s time, slightly less if you’re attending Anthocon, you’ll be able to buy a paperback copy of Thy Fearful Symmetry. When you have a copy of your own to covet, you may decide (at a time and place of your choosing, probably when nobody else is watching you) to place it upon a wooden table and take a photograph of it, so that you will always remember what it looked like in its pristine, freshly printed glory. If you follow such a course – and who in their right mind could resist such private pleasure – the resulting image may end up looking almost exactly like the one above. At that moment, you will remember this blog post, possibly returning to its unique place on the Interwebs to confirm with your very own eyeballs that your memory is not playing tricks on you. You will stare at the picture above, then at your very own likewise efforts, and wonder how I could possibly have made such an accurate prediction. Fear not, cognitive weaklings. I have not developed svengali-like powers of augural, psychic all-seeingness. This is all simply a coincidence*. Desist immediately in your plans to run up to me in the street and scream “What number am I thinking of now, freakboy?” at my curiously alluring face. Save such capers for that prankish brain-wobbler Derren Brown. He bloody loves it, particularly when going about his daily business, buying groceries or trying to enjoy a steaming beverage in a favourite coffee house. Often, he’ll be so delighted that he will give you spontaneous money, in recognition of the absolute pleasure he feels at your wholly appropriate shrieking. I have created the above kodachrome so that I may share with you my personal delight at the heft and texture of what is at the time of writing the only print copy of Thy Fearful Symmetry in the whole world. It’s the proof copy, and a thing of rare splendour, through and through. I couldn’t be happier with how it’s turned out. In other TFS news, I was delighted a week or so ago to read this review from Lavanya Karthik at Bookpleasures.com. Not only is the review excellent (and spoiler-free, like the best of reviews – you can safely go and have a read if you’ve yet to try the novel), but Lavanya’s based here in India with me (well, not with me as such – she’s somewhere in Mumbai, while I’m in Delhi). Nice to know that my novel’s been read by at least one person on the same land mass as me. Lavanya would like you to be aware that Thy Fearful Symmetry offers “a seamless narrative, energetic writing, an inventive and complex storyline and a stunning climax with one final audacious surprise”. Almost makes you want to read the book, doesn’t it? If that wasn’t good news enough, the novel is also one of the author picks of the month over at the Alliance of Independent Authors. That means that one of the members recommended it for the honour, and others agreed that it represents a fine example of independently published fiction. You really should give the book a try, one of these days. Remember remember, the fifth of November… because that’s the last time the Kindle edition of the novel will be available to download free from Amazon. When it happens, I don’t know how Interwebbed I’ll be, because I’ll be bedazzled and bemused somewhere in Boston that day. I hope you’ll give me a hand letting people know TFS is free for those twenty-four short hours. It actually will be tremendously helpful. Both the UK and US Amazon sites have brief but pleasing reviews up from people who downloaded it for free last month. Both commented on having little expectation that a free ebook would be any good, and their surprise at being completely wrong. I’d like to surprise even more people, in exactly that way, if I can. The next couple of weeks are going to be all about the US. I have to find somewhere to ship copies of TFS and Cuckoo, so I have some stock at my author table at the convention (failing which, I will have to fill my author table with actual authors, and they can be difficult to arrange in an eye-pleasing way). I also have to prep the ebook for distribution to non-Kindle ereaders, such as iTunes, the Nook, and the Kobo. By the time I get back from the US, all the work will be done. Thy Fearful Symmetry will, as a work-in-progress, be complete. I’m looking forward to that, but I’ll sort of miss it as well. *or is it? But is it? Or is it?